The beautiful new Union campus was the site of the third annual Harker Alumni Families Easter Egg Hunt. Held on the morning of March 23, the event attracted more than 100 attendees, triple the number of participants over previous years. In the past, the egg hunt had been held at the Bucknall campus. So for many alumni it was their first visit to Harker’s recently acquired third campus, home of the soon-to-be-launched preschool opening this fall, and future permanent site of the lower school. Some of the alumni who came out for the fun family event are now themselves parents of current Harker students (or soon-to-be Eagles). Hearing the sounds of their own children at play on the new campus served as a perfect backdrop for those who opted to take a guided tour of the property, which many remarked already felt like an elementary school, despite the construction under way. 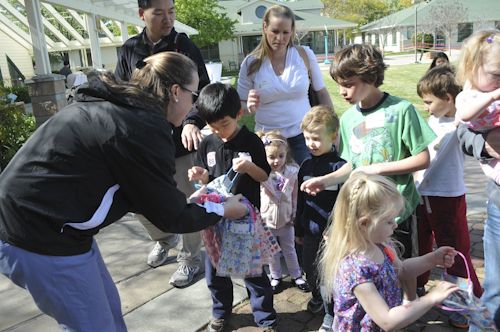 The atmosphere of the egg hunt was playful, with eggs strategically hidden throughout the grounds of the Union building. Adding to the festive mood was a bounce house and arts and crafts tables complete with child-friendly make-it-yourself projects, including egg shaped magnets, bunny masks and color-your-own crowns. A visit by the Easter bunny rounded out the morning.